Yet the politicians and editorials in the corporate media persist in calling for more growth, even though income disparity was never solved by growth or by growth strategies. It is becoming ominously clear that the ecosystem suffers catastrophically from industrial growth and its side-effects. Because of priorities set from on high, almost never heard is the warning that the huge number of human consumers depending on dwindling non-renewable resources is dangerous and unsustainable. At the same time, an alternative system or culture against endless growth is kept out of public discussion except in small circles. For why would corporations want people to make their own clothes or furniture, grow their own food, and trade services and crafts amongst themselves? Why would any government engaged primarily in raising revenue for the military, building more roads, and developing expensive "security" systems want to see taxable income not rise and rise? Who wants to be first to turn his or her back on a "good job" and see their ability to buy things dry up? Such questions and their answers require a different way of thinking. A new path is called for when the odds are progressively lower for resumed growth as-we-knew-it. For we entered the post-peak conventional oil era about the time of the 2008 Financial Meltdown. Concurrently, global warming increasingly threatens our life-support systems, throwing another monkey wrench into growth. The new path is pursued by permaculturists, eco-villagers, co-ops, and anarchic do-it-yourselfers -- and their economist gurus. Yet this trend has a long way to go, to offset the ravages of growth and retire the quest for becoming a billionaire. In the absence of a movement actively dismissing Wall Street and the global corporate pollution complex, a near consensus is approaching on what needs to be measured for defining a livable future. The work of Robert Costanza and other economists specializing in sustainability recognize that "eco" applies to the ecosystem as well as economics. This approach is a cut above the "study the problem" syndrome, a safe-haven of the funded environmental movement. 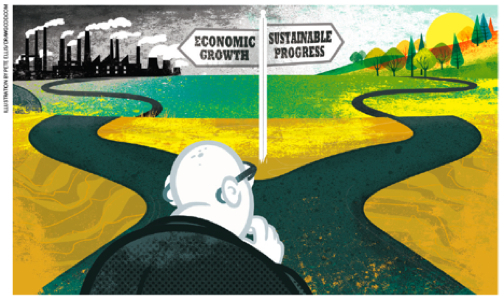 Eco-economics also cuts through the pretenses of the technofix wing of the environmental movement/industry, whose main drawback is the failure to encourage positive life-style change to reduce pollution and improve local economics. The technofixers sometimes give lip service to "less-is-more" -- while perpetuating the myth of a constantly growing consumer economy. The Center for the Advancement of the Steady State Economy (CASSE) is another group of eco-economists, centered around the work of Herman Daly. They critique perpetual economic growth, wrongheaded federal policies supporting fossil fuels, and focus on growth's symptoms such as the nuclear power threat. One of CASSE's fellows, Brent Blackwelder, told Culture Change "With the 582 reactors that have delivered electricity to the grid over the last half century there have been 10 core meltings in the 14000 reactor-years the plants have run. What this means is an astonishing failure rate (core melting partially to fully) on average every two and a half years." Costanza & colleagues' new report is a survey of well-being indices, such as the Gross National Happiness Index used by Bhutan: "This measure uses elaborate surveys that ask how content people feel in nine domains: psychological well-being, standard of living, governance, health, education, community vitality, cultural diversity, time use and ecological diversity... Subjective well-being has been highly studied, and has even been recommended as the most appropriate measure of societal progress. But subjective indicators are tricky to compare across societies and cultures." 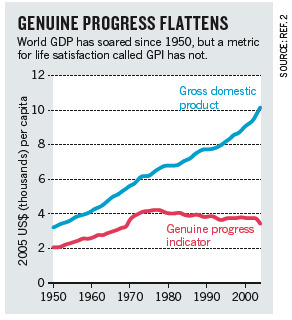 Enter the genuine progress indicator (GPI). [See chart below] Although, the authors caution, "no alternative measure stands out as a clear successor" to GDP. How can the GPI succeed in the real world corrupted by fossil fuels industries? "Former U.S. President Bill Clinton’s small move towards a ‘green GDP,’ which factored in some of the environmental consequences of growth, was killed by the coal industry." The study's nod to political reality reveals that corporate influence or corruption is the obstacle that alternative economic theory cannot seem to surmount. Only the dismantling of the system, either by people or nature, can do that. "Robert F. Kennedy once said that a country’s gross domestic product (GDP) measures 'everything except that which makes life worthwhile.' The metric was developed in the 1930s and 1940s amid the upheaval of the Great Depression and global war. Even before the United Nations began requiring countries to collect data to report national GDP, Simon Kuznets, the metric’s chief architect, had warned against equating its growth with well-being. "GDP measures mainly market transactions. It ignores social costs, environmental impacts and income inequality. If a business used GDP-style accounting, it would aim to maximize gross revenue — even at the expense of profitability, efficiency, sustainability or flexibility. "Increased crime rates do not raise living standards, but they can lift GDP by raising expenditures on security systems. Despite the destruction wrought by the Deepwater Horizon oil spill in 2010 and Hurricane Sandy in 2012, both events boosted US GDP because they stimulated rebuilding." The genuine progress indicator (GPI) metric is "calculated by starting with personal consumption expenditures, a measure of all spending by individuals and a major component of GDP, and making more than 20 additions and subtractions to account for factors such as the value of volunteer work and the costs of divorce, crime and pollution. "Crucially, unlike other measures in the first group, GPI considers income distribution. A dollar’s worth of increased income to a poor person boosts welfare more than a dollar’s worth of increased income does for a rich person. "Any ‘top-down’ process must be supplemented with a ‘bottom-up’ engagement of civil society that includes city and regional governments, non-governmental organizations, business and other parties. We recently formed the Alliance for Sustainability and Prosperity to do just that." Robert Costanza and Ida Kubiszewski are at the Crawford School of Public Policy, Australian National University, Canberra. Enrico Giovannini is in the Department of Economics and Finance, University of Rome Tor Vergata, and minister of labour and social policies in the Italian government. Hunter Lovins is at Natural Capital Solutions, Longmont, Colorado. Jacqueline McGlade is at University College London, and the United Nations Environment Program, Nairobi, Kenya. Kate E. Pickett is in the Department of Health Sciences, University of York, UK. Kristín Vala Ragnarsdóttir is at the Institutes of Earth Sciences and Sustainable Development Studies, University of Iceland, Reykjavík. Debra Roberts is in the Environmental Planning and Climate Protection Department, eThekwini Municipality, Durban, South Africa. Roberto De Vogli is at the University of California, Davis. Richard Wilkinson is in the Division of Epidemiology and Public Health, University of Nottingham, UK. 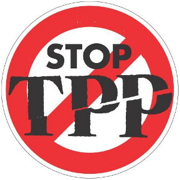 Center for the Advancement of the Steady State Economy which covers topical developments such as the Trans-Atlantic Free Trade Agreement (TAFTA)/Transatlantic Trade and Investment Partnership, and the Trans-Pacific Partnership (TPP). We, a finite sentient planetary species, needs to develop appreciation for "limitation". The sorts of limitations that stem from the Finite Existence Sector Of Creation.